TODAY was a busy day with several errands, so I didn’t have the time to finish a post. Sankei Shimbun/Fuji TV released the numbers for their 1-2 September poll, however, and a quick look at those will do nicely as a substitute. Q: What did you think of South Korea President Lee Myung-bak’s visit to Takeshima? Q: Should President Lee Myung-bak withdraw his statement to the effect that the Emperor should apologize if he visits South Korea? The South Koreans are trying to reassure themselves that the recent Japanese attitude is to be attributed to “right-wingers”. If that’s the case, the entire country is about 90% rightwing. Q: Should the government take economic and financial measures against South Korea? Q: Do you think the forced repatriation of the Hong Kong activists who landed illegally on the Senkakus was appropriate? A no answer means they should have been prosecuted and jailed. A yes answer means pragmatism. Q: What do you think of the Noda government’s plan to purchase the Senkaku islets for the government? Q: Do you support the Noda Cabinet? The South Koreans are also trying to reassure themselves that Prime Minister’s behavior was an attempt to perk up his poor poll numbers. So much for that idea. I suspect the Japanese public would expect the same behavior in these circumstances — at a minimum — from any prime minister, so the numbers reflect domestic concerns. Speaking of trying to boost one’s poll numbers, it’s widely assumed both in South Korea and Japan that President Lee’s visit to Takeshima and his comments about the Emperor were designed to goose his and his party’s popularity. He was sitting at 17% this time last month, and one South Korean newspaper poll had him picking up 9 percentage points as a result. In other words, he’s climbed to Mr. Noda’s dismal level of support. The things politicians do for a little — and I do mean a little — cheap popularity. Other results reveal why Tanigaki Sadakazu is likely to be removed as LDP president in the upcoming party election. This is important because the LDP chief, whoever it is, could well be the prime minister before the year is out. Q: Which of the two party leaders do you think is more suited to be prime minister? Q: Which of the two party leaders do you think has greater leadership ability? Q: If a lower house election were held now, for which party would you cast your vote in the proportional representation phase? And One Osaka is still not officially a party yet (though that will change by the end of the week). Japanese domestic politics is on the verge of a paradigm shift. It is not a question of if, but rather of when. This is an example in which the cliched campaign boilerplate of the Democrats in the United States is actually applicable for once: The Japanese public really is sick and tired of being sick and tired. To modify another cliche, they are (calmly) mad as hell, and they aren’t going to take it any more. The English-language news media won’t understand it, the Chinese and the South Koreans won’t like it, and broadly speaking, most Japanese won’t give a flying fig about what any of them think. The name of the group is Boom Pan. The name of the song is Surfing Tuba. Yes, it is surf music with a tuba. The adoption of the resolution in the upper house censuring Prime Minister Noda, driven primarily by the Liberal Democratic Party, is absolutely ridiculous. It has no meaning whatsoever. Why are they causing such a big fuss? (Party President) Tanigaki says that the government has reached the limits of its abilities to respond to the challenges Japan faces, but it is really is just a call to quickly dissolve the lower house. 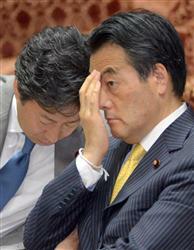 The Noda-Tanigaki summit meeting should already have produced a promise to dissolve the lower house. THE expression Moto no Mokuami refers to a situation that has returned to its original inauspicious state after having improved for a time. It derives from a story more than 400 years old about Mokuami, a blind man whose voice closely resembled that of a warlord. The warlord died when his son was too young to assume the duties of his position, so — in accordance with the warlord’s will — Mokuami was brought to stay in his darkened room to impersonate him as a man on his sickbed. When the son came of age, the death was announced and Mokuami became John Doe again. That’s an excellent way to describe what’s happening in the opposition Liberal-Democratic Party, the former governing party for most of the past 50+ years. What has become known as the Period of Rapid Growth occurred during the early part of their rule under their management, and part of that growth derived from rebuilding the national infrastructure. There’s more than one way for all good things to come to an end, and one of them is maintaining and expanding a good thing until it becomes a bad thing. 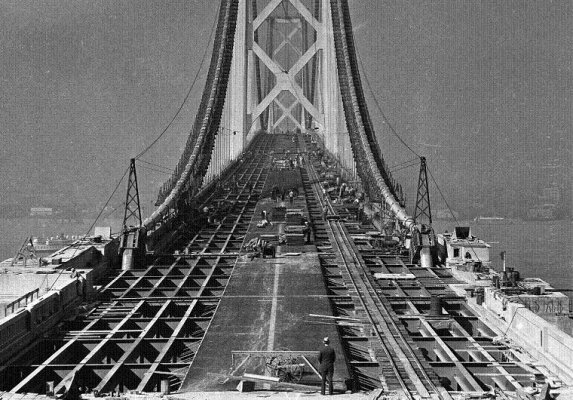 In this case, essential infrastructure projects devolved into bridges and roads to nowhere, fueled by the ties that had arisen between the construction industry, the bureaucracy, and national legislators who were de facto lobbyists for either or both. Enough pork was distributed to cause the entire population of the Ummah to go into cardiac arrest. Eventually public disgust at the excesses, the abuses, and the criminality spurred movements for reform, even within the party. That culminated in the election of Koizumi Jun’ichiro as prime minister in 2001. It was significant that he owed his election to local party members around the nation, rather than those who forgot the national interest after coming to the national capital to serve it. One of the Koizumi reforms was a reduction in national government expenditures on public works during his administration. Politicians can’t be counted on for much, but a Japanese politician can always be depended on to ignore the lessons of history. Thus, on 1 June, not quite six years after Mr. Koizumi left office, the LDP approved a bill to “strengthen the national infrastructure” and submitted it to the lower house of the Diet. 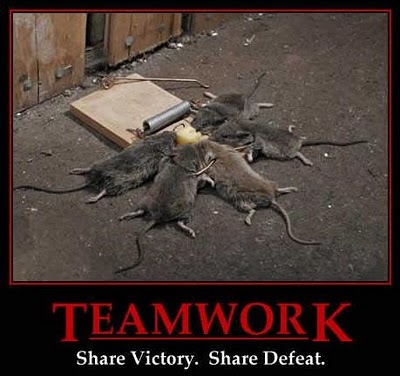 If it does not pass, it will become part of their next election manifesto. The proposal calls for the expenditure of JPY 200 trillion on construction projects over the next 10 years. Since the public sector is already floating away on money made of lighter-than-air gases, this is to be paid for by helium-filled government bonds. The party’s goal of halving the deficit for the primary balance will be postponed. Not to worry — the LDP assures everyone that the measure will whip deflation soon, if not sooner. 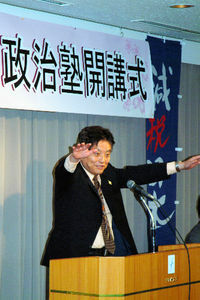 People such as newspaperman/author Hasegawa Yukihiro have written books explaining that the Kasumigaseki bureaucracy dispatches people every day to the offices of Diet MPs to peddle legislative proposals that will benefit their individual ministries, while sending other people to the news media to provide the raw material for stories to justify those proposals. The implied threat is that the ministry will cut that media outlet out of the information loop if it fails to run the story. They seldom have to bring the hammer down, however. Anything that lessens the burden of meeting the daily content quota is fine with the media. So it was no surprise that shortly after the LDP put together its bill, articles appeared in the nation’s newspapers reporting that the Ministry of Land, Infrastructure, and Transport is concerned about the state of the nation’s infrastructure built during the Period of Rapid Growth. The Ministry says the assumed lifespan for bridges in 50 years, and 8% of the more than 150,000 bridges (of at least 15 meters) nationwide are now that old. Wouldn’t you know it? In 10 years (the duration of the LDP proposal) that figure will rise to 26%, or about 40,000 bridges. Those articles contain all sorts of statistics beyond the ability of the average journo to ferret out on their own. Such as: The incidence of crack repair in those bridges rose from 680 in 2008 to 1129 in three years in the Tokyo area. Roughly 260,000 problems needing attention have been discovered on highways in the Tokyo area since 2002, but 97,000 were still not fixed by 2009. Water lines are also rotting out, with work needed on 120 kilometers of supply lines in and around the capital. It was thoughtful of the ministry to add that complete repair would take 200 years at the current rate of work. This seems to have been a national effort. At the same time, an article appeared in the Nishinippon Shimbun based in Fukuoka City citing the same needs, with a focus on bridges in Kyushu. That article added the delay in bridge repair was particularly pronounced for structures managed by municipalities. It was thoughtful of the newspaper to add that local governments are faced with financial difficulties and can’t pay for it themselves. The Kasumigaseki team also consists of what are called goyo gakusha, i.e., academics who are Purveyors to the Government Household. Thus, Kyoto University Prof. Fujii Satoshi (who moonlights by writing columns for the Nikkan Kensetsu Kogyo Shimbun, a daily newspaper for those in the construction industry) strongly supports the bill. He claims it would boost GDP by JPY 400 trillion, end deflation, and save tens of millions of lives that might be lost in natural disasters. E-nuff. Few economists anywhere agree on the extent of the multiplier effect of government stimulus, but only government stand-ins think it’s that high. (Many think the multiplier effect is actually negative.) If GDP were to rise by JPY 400 trillion, it would translate to 8% annual economic growth, only slightly lower than the 9% achieved from 1953 to 1965 and considerably lower than the 4-6% of the 70s and 80s. That would also eliminate the primary balance deficit. Hey, what’s that up there in the sky? Can’t you see it hovering just above that roof? Yeah! It’s a pie! Those academics not on the payroll point out that adding supply in a sector beyond the requirements of demand is unlikely to end deflation, infrastructure improvements will not save that many lives because most people die in their homes during disasters (when the house collapses or burns to the ground), and stimulus of this sort is not “quality GDP” that benefits the real economy over the long run. Others realize that pork of this sort is unlikely to win the LDP votes as it did in the old days. It would be more likely backfire by repelling independent urban voters who remember the stench and voted for the LDP only to support the Koizumi reforms. The one thing the politicos will gain is a reliable source for buying tickets to their fund-raising banquets. Now that they can pay for the campaign, all they have to do is find someone to vote for them. Not everyone in the LDP likes it either. Some mid-tier MPs complained that the legislation ignored the government’s fiscal problems, and that the idea was out of synch with the times. LDP President Tanigaki Sadakazu admitted that some people might see it with a gimlet eye, but he insisted the fiscal deficits were caused by social security programs and not public works investment. Give him credit for being half-bright. The fiscal deficits are caused by government spending on everything it spends money on in excess of its revenue, and big fiscal deficits are caused by big spending far in excess of its revenue over many years. 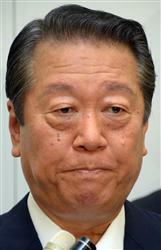 New Komeito, still the LDP’s nominal partners, criticized the measure for being excessive. They agree that infrastructure repair is needed, but their proposal calls for only half of the expenditure over the same time period. Members of that party also knew the committee that drafted the bill was headed by Nikai Toshihiro, a former Minister of Economy, Trade, and Industry, and the head of the old Transport Ministry. They wondered why they were supposed to support a bill shepherded into the Diet by a man widely considered to be tucked in the construction industry pocket. If this is the best they can do after being in the opposition for three years, the LDP is just as much in the dark as Mokuami, and just as likely to be sent home. Most of their benefactors died a quarter of a century ago. * Prof. Fujii also argues that excessive structural reform harms social welfare levels, is opposed to regional devolution and the TPP, and thinks eating earwigs is good for digestion. * Speaking of social welfare, there is an interesting Twitter conversation (to the extent that Twitter conversations are interesting) containing suggestions that social welfare should be kept at current or higher levels to maintain social order. Some people stopped thinking too soon — had they kept going, one of the conclusions they’d have reached is that the apprentice system for the trades should be restored. The Beach Boys wished they all could be California girls. I wish they all could be Tokyo girls. Unless the Noda Democratic Party swallows whole the tax increase proposal of the Tanigaki Liberal Democrats and dissolves the lower house (for a general election), it will only create a synergistic effect of unpopularity for both the Tanigaki LDP and the Noda DPJ. The lower house will have to be dissolved next year anyway (when its term ends). Will that dissolution occur when the synergistic effect is at its maximum? That might be even more invigorating for everyone. It would give (Hashimoto Toru’s) One Osaka enough time to get ready. – Hasegawa Yukihiro, author and member of the Tokyo Shimbun editorial board. DPJ Secretary-General Koshi’ishi Azuma and other party members are now coming out in favor of holding a double election next year, when the current lower house term expires and an upper house election will be held as scheduled by law. 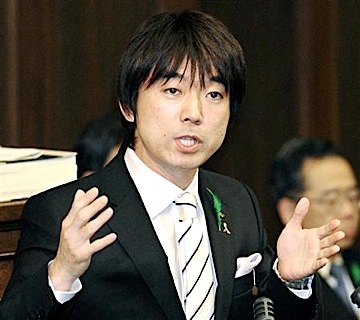 Others, however, such as LDP upper house member Yamamoto Ichita, one of the last of the party’s Koizumians, notes that Prime Minister Noda, Deputy Prime Minister Okada, and Finance Minister Azumi are suggesting they are open to modifying the DPJ tax hike plan. Mr. Yamamoto is appalled, because he thinks this is a sign that (a) they will swallow the LDP plan whole, and (b) that will lead to a grand coalition without a Diet dissolution. And that will lead to even more support for One Osaka. THE political and social forces in Japan are now arrayed and moving on a course that makes a noisy electoral collision inevitable. How the forces sort out post-collision isn’t possible to determine, but one thing is certain — the collision will be just one of the major engagements in an ongoing war. That much is clear now that we’ve seen the evisceration of the work of Koizumi Jun’ichiro after he steered Japan to the course of reform. The reactionary Politburocrats included the old guard of his own party, the bureaucratic establishment at Kasumigaseki seeking to reclaim sovereignty over policy, and the chancers of the Democratic Party snouting around for any excuse to rise to the level of Politburocrat Nouveau. They accomplished their work in less time than the five years Mr. Koizumi spent in office. Last week, the Men of System demonstrated again how they operate. The ruling Democratic Party lacks an upper house majority, so it was unable to prevent the opposition from censuring two Cabinet ministers: Maeda Takeshi of Land, Infrastructure, and Transport (for political misbehavior) and Tanaka Naoki of Defense (for being a doofus on the job). Everyone understands that it’s a chabangeki farce staged to gain political advantage. Mr. Tanigaki and most of his party already back a consumption tax increase, and the ruling Democratic Party intends to use only 20% of the revenue from the increase for social security. A larger amount will be allocated for public works projects. Just like the old LDP. The DPJ understands the farce better than anyone because upper house censure was a weapon they created to gain political leverage after they and their allies took control of that chamber in 2007. They censured then-Prime Minister Fukuda Yasuo in 2008 for reasons that were trivial then and which no one can remember now. Both men of course realize that’s beyond the capabilities of Mr. Tanaka, but they have appearances to maintain and the Ozawa wing of the party to mollify. Their display of plastic backbone has caused some consternation in Japan’s real ruling class, however. That spurred one of their agents in the DPJ to give the prime minister his marching orders. That would be Fujii Hirohisa, the former head the Finance Ministry’s Budget Bureau — Dirigiste Central — also the former secretary-general in Ozawa Ichiro’s old Liberal Party, the first finance minister in the DPJ government (for all of three months), the head of the Tax Commission in the Cabinet Office, one of the DPJ’s Supreme Advisors, and (if the rumors are to be believed) a daytime drinker. Now what is Mr. Noda to decide to do? He wants to project himself as a man of vision with the unwavering resolve to gouge the public and maintain the system do what is best for Japan. He also reportedly hates being called a Finance Ministry puppet. On the other hand, Mr. Fujii has been molding Mr. Noda since the DPJ formed its first government, when the latter was the deputy finance minister in both the Hatoyama and Kan administrations. The prime minister is also aware that the Finance Ministry is capable of using the various means it has developed for staging de facto internal coups d’etat. In other words, look for Messrs. Maeda and Tanaka to start cleaning out their desk drawers, soon rather than late. The Asahi insists the voters can have their say after the tax increase has been safely passed. That’s the same strategy foreseen months ago by ex-ministry official and current reformer Takahashi Yoichi. As a newspaper of the left, the Asahi might be expected to favor higher taxes and stronger central government, but perhaps they have a more compelling reason. That would be explained by another news report that the Asahi tried to hide in an overlooked part of the paper, but which the rival Yomiuri Shimbun gave more prominent coverage on 30 March. It seems that a tax audit revealed the Asahi failed to report JPY 251 million in corporate income over a five-year period that ended 31 March 2011. They were required to pay substantial penalties. On the other hand, the bureaucrats are not picking on just the Asahi. All the newspapers and their reporters are being audited, which is a process that can take from several weeks to several months. The reporters treat their sources, anonymous or otherwise, to food and drink, and we all know that expense accounts are there to be padded. Tax officials are even said to be visiting the eating and drinking places listed on the returns for confirmation. Both the Asahi and the Yomiuri already had to refile their taxes in 2009. The Asahi insists their editorials are unrelated to the audits, and they might have a point. There are about 20 people on the paper’s editorial committee, and all of them support a tax increase. Most of them once covered the Finance Ministry as members of the ministry’s kisha club, a system that combines short leashes with exclusive access. And many of them are also graduates of the University of Tokyo, which is the institution of choice for the Finance Ministry’s recruitment. It’s natural to assume that the members of the old boys’ club would think alike, but a tax audit certainly helps to focus their thinking. Mr. Kawamura is screening and preparing candidates for the next lower house election by using the same juku mechanism employed by Osaka Mayor Hashimoto Toru and Aichi Gov. Omura Hideaki. There will likely be an alliance of some sort between those local parties and Your Party at the national level. Their message is the largely the same. Delivering that message on Saturday as the first lecturer was former METI official turned bureaucratic reformer Koga Shigeaki. Mr. Koga rebuffed requests to run for governor of two prefectures to serve as Mr. Hashimoto’s senior advisor, and he also has connections with Your Party. He told the juku students something that everyone in Japan apart from the Politburocratchiks understand: The current system of governance is dead, and the creation of a new system starts with civil service reform. The experience of Koga Shigeaki illustrates one of the many reasons that Japan’s Democratic Party has become part of the problem instead of the solution. He was selected as an aide to then-Reform Minister Sengoku Yoshito in the Hatoyama Cabinet, but that appointment lasted only a few days. Kasumigaseki wouldn’t stand for it, and Mr. Sengoku is not one to stand on principle when his place in the power structure is at stake. Indeed, the former lawyer confronted Mr. Koga with a semi-gangsterish threat (likely picked up from his former clients) during the latter’s Diet testimony on reform at the request of Your Party. Try this for a thought experiment: Imagine that the cities of Chicago and Los Angeles, and their respective states of Illinois and California, are governed by local parties calling for radical governmental reform. One of the primary planks of that reform is putting a leash on the public sector. Three of those four chief executives were once members of the two major parties. The deputy mayor of New York is a colleague, and the mayor is a sympathizer. Need I mention that this would be topics #1, #2, and #3 in the American mass media 24/7, and that the Journolist-coordinated efforts to slime them all would be rank even by their standards? Predictions are usually a waste of time, but here’s one you can hold me to: The English-language media in general, and the FCCJ lackwits in particular, won’t bother to notice what’s happening in Japan until they find themselves ankle-deep in the muck after the bloodletting of the next general election, and some well-coiffed and -dyed heads will be adorning the tops of pointed stakes. The media will then be “surprised”. And then they’ll launch a slimeball fusillade. Take it to the bank. Yes, this is a national phenomenon. It’s happening again, this time in the city of Kasumigaura, a largely agricultural town of 43,600 in Ibaraki Prefecture. After the city was created in 2005 through the merger of two smaller municipalities, the residents expected to benefit from the economies of scale. They really should have known better. Instead of one unified municipal office, the new city officials created two, one in each of the constituent entities. One of them required the construction of a new building. They also separately maintained their former methods of collusion for deal-cutting: one controlled by the civil service, the other organized by private sector industry. It got worse after the new city’s second mayor took office in 2007, when he was unopposed in the election. Opposition quickly materialized after the city council voted themselves a 40% pay raise. A citizens’ group was organized, and they ran Miyajima Mitsuaki for mayor in the next election. He upset the incumbent by a 276 vote margin. The mayor therefore announced last week that he and the citizens’ group will start a petition drive to recall City Council. They’ll have a month to come up with 15,000 signatures. It won’t be easy, but Mr. Kawamura overcame the same hurdle in Nagoya, and his hurdle was much higher because of that city’s larger population. I wouldn’t bet against them. It bears repeating that the next lower house election will not be the last battle of the war, regardless of the result. The reformers at the regional level have found their voice and their allies are not going to go away. Meanwhile, the Politburocrats are stocking the moat with as many alligators as they can breed. The current system of governance requires that the bureaucracy oversee the process as the Cabinet formulates a bill and the ruling party examines it before it’s submitted to the Diet. Defying the wishes of Kasumigaseki requires a thorough knowledge of policy and some serious spine, neither of which is a hallmark of the political class anywhere. The civil servants devote a lot of time to anticipating objections to their favored policies and formulating arguments against those objections to feed to the politicians. 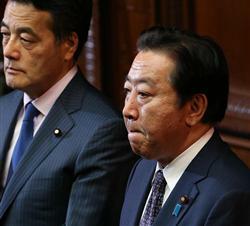 One advantage of the reformers is that people such Your Party’s Watanabe Yoshimi and Eda Kenji, Hashimoto advisors Koga, Sakaiya Taiichi, and Hara Eiji, as well as advisor to both Takahashi Yoichi, have extensive knowledge of policy and Politburocrat tactics, and took a clear public stand long ago. Another man who combines both is Takenaka Heizo, a Cabinet member throughout Koizumi Jun’ichiro’s entire term of office, and the man responsible for producing the Japan Post privatization package. Mr. Takenaka has said that victory will require 10 years of continuous guerilla warfare. In short: Japan is in the midst of the most civil Civil War a modern democracy has ever seen. The Prime Minister’s Office unveiled its new website earlier this month, which they created as a portal site to provide comprehensive information on policy. That’s a fine idea, but the Jiji news agency reported the redesign of the old site required an expenditure of JPY 45.5 million (almost $US 560,000 on the nose). What? You didn’t hear the detonation on the Internet? A lot of people thought it could have been done for 10% of that amount, and some said they would have been happy to take the job at that price. They also said they wouldn’t have created a site with text that was unreadable for those using Apple’s Safari browser and without the kanji errors on the page for children. Piano prodigy Okuda Gen appeared on television again Sunday night. Now ten years old, Gen has been playing piano since the age of four and giving concerts since the age of seven. He’s composed 50 pieces of his own. He likes all sorts of styles and plays classical music well, but is a particular fan of jazz pianist Oscar Peterson. On Sunday, he performed as an equal with an adult drummer and bassist. The boy is remarkably self-assured for his age, even without his musical ability. It seems unlikely at this point that he’ll acquire the problems that usually attend children such as these when they enter The Jungle of Puberty. But the most astonishing part of Gen’s story is that he started playing because he thought he would like it. Neither parent is involved with music, and they say he’s never taken a music lesson. Here he is at age eight. Pull your socks up. Whether it is the result of confrontation or discussion between the DPJ and LDP, a Diet dissolution and general election in June is probably unavoidable. What will the issue in that election be? It will undoubtedly be Prime Minister Noda’s consumption tax increase, but what is LDP President Tanigaki doing? During the campaign for the 2010 upper house election, Mr. Tanigaki said, “As a responsible opposition party, we must resign ourselves to a consumption tax at the 10% level.” Yet now he is complaining about a consumption tax increase and demanding the Diet be dissolved. His opposition to a consumption tax increase is nothing more than a procedural argument: the DPJ said they would not raise the consumption tax during their (four year) term. The once-dominant party is now driven only by political crisis. How they have fallen. The DPJ is calling for reform that integrates social welfare with the consumption tax, but they will introduce a bill only to raise the tax, divorced from a pension scheme. If the bill passes, no means have been created for accepting the increase in revenue. At first, it will most likely be used to offset the fiscal shortfall. If that happens, it would be just as the Finance Ministry planned it. Earlier this week, the LDP said that one part of their next election manifesto would be a call to raise the consumption tax to 10% “for now”. The most recent FNN/Sankei poll showed disapproval of the Noda Cabinet at 51.6%, a 14.5 percentage-point jump in a month, and an approval rating of 35.6%, a 6.8-point decline. This is the first of the major media RDD polls to show a thumbs-down majority. The Noda Cabinet has bought into the abnormal beliefs of the Finance Ministry and is running hell bent for leather on the tax increase track. Hasn’t their shallowness been exposed? We still have a “learner’s permit” Cabinet. The prime minister’s leadership or message to the people are nowhere to be seen. I suspect the feeling of most people is that (the Cabinet) lacks the ability to appropriately deal with important problems. It is natural that we cooperated in the three-party conference (with the DPJ and New Komeito) and the recovery effort…but we must graduate from the three-party conference to draw a distinction between ourselves and the DPJ. The time for that will come next year…There are many issues on which we cannot cooperate with the DPJ, even if we wanted to, such as the Constitution, education, and foreign affairs and security. Some legislative proposals absolutely must not pass, such allowing foreigners to vote, and permitting collective bargaining agreements for public employees. Meanwhile, the Asahi poll was also released. The disapproval numbers exceeded those for approval for the first time in that poll, but did not exceed 50%. 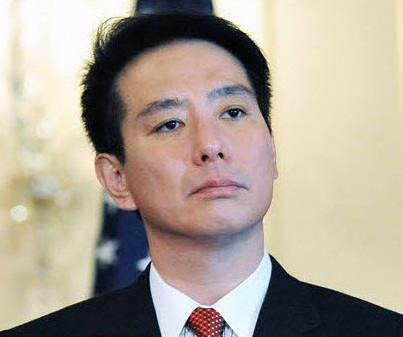 Koizumi Shinjiro, the director of the LDP’s Youth Division (and the son of the former prime minister), strongly criticized LDP President Tanigaki Sadakazu for such statements as “It is not good for Japan to excessively cooperate with the United States while omitting China and Asia.” He stressed that the Japan-U.S. relationship should be the axis for both the Japanese economy and diplomacy. This is a good point. The TPP is of no great significance economically, but it is of great diplomatic significance as a Japanese-American economic alliance promoting economic integration with Asia on a Japanese-American axis. The LDP removed the younger Koizumi from his post as chairman of the lower house Rules and Administration Committee because he did not support a motion against the TPP. (The prime minister) did not mention either the TPP (Trans-Pacific Partnership) or the Futenma air base, and he said nothing about the consumption tax. He conveyed no message of what it is he wants to do. Prime Minister Noda is using a low profile to sell himself. LDP President Tanigaki is restrained in his public statements. Neither leader of the two major parties is conveying a strong message. The Nikkei Shimbun quoted the responses of the leaders of the five major opposition parties to Prime Minister Noda Yoshihiko’s inaugural speech in the Diet this week. Here they are. That method was straight out of the past. The bureaucrats wrote it. There was no explanation of any specific approach on their part as a government. I felt that it left something to be desired. My impression was one of flowery language connected by bureaucratic boilerplate. An examination and soul-searching of the DPJ’s response to the earthquake/tsunami and nuclear accident is needed. It was a bureaucratic composition with no central axis. It was like the LDP before the change of government.